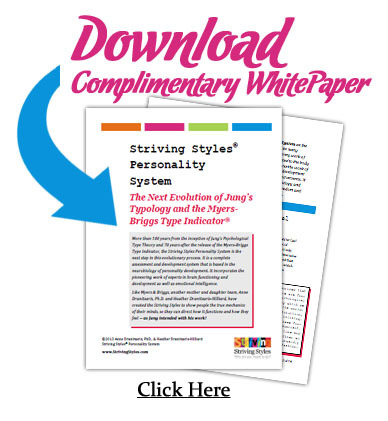 More than 100 years from the inception of Jung’s Psychological Type Theory and 70 years after the release of the Myers-Briggs Type Indicator, the Striving Styles Personality System is the next step in this evolutionary process. It is a complete assessment and development system that is based in the neurobiology of personality development. It incorporates the pioneering work of experts in brain functioning and development as well as emotional intelligence. The Striving Styles® Personality System is the third step in the evolution of psychological type theory and its many applications. It builds on Jung’s theory as well as the pioneering work of Myers, Briggs and all of the practitioners that have contributed to the body of knowledge surrounding the MBTI®. In addition, it integrates the work of top theorists of the 20th and 21st centuries, on psychological development and emotional intelligence, as well as recent findings from neuroscience. It shows how psychological functions are embedded in our physiology and linked to our emotions. Most importantly, it gives people the wisdom and power they need to self-actualize by re-patterning their brains. Like Myers & Briggs, another mother and daughter team, Anne Dranitsaris, Ph.D. and Heather Dranitsaris-Hilliard, created the Striving Styles to show people the true mechanics of their minds, so they can direct how it functions and how they feel -- as Jung intended with his work! Jung believed we have four mental functions in consciousness, meaning that our brain has four distinct areas in which these functions are located. During Jung’s lifetime, his theory was impossible to prove, as the technological advances that allow us to look at the brain to see how it lights up when the functions are used simply did not exist. However, we now have this information available to us and pioneers like Katherine Benziger, Arlene Taylor and others have endeavored to connect Jung’s functions with brain functions. As the SSPS incorporates the neuroscience of personality and brain development, it allows us to leverage what we have learned through the MBTI. As a result, we can now enhance our ability to understand and help others achieve their potential. 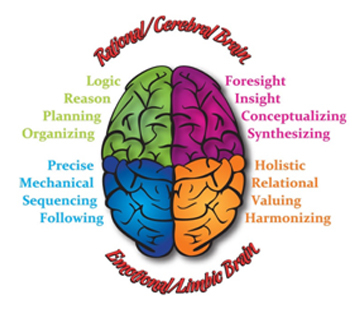 The work that has been done by people such as Roger Sperry and Ned Hermann show us that the brain has two hemispheres with two areas of specialization on each hemisphere. This results in four quadrants. Rather than the points on the compass, we have the four quadrants of the brain, each with their own role to play in our personality and in consciousness. While Jung believed they were opposite – and they can appear that way – each specialized function is necessary for us to achieve our potential as human beings. Now that we have embraced the developments in brain specialization and dominance and incorporated them into the SSPS, people are now able to gain more insight into how their brains work and take charge of their own development. Finally, everyone dedicated to using Jung’s Psychological Type theory, the MBTI and other Jungian personality tests can integrate the advantages of brain science and neuroplasticity. With the SSPS we can understand the mechanics of our mind, how our brain develops, how to use our emotions to achieve our potential and how to integrate our brain for optimum happiness. Knowing I need to be connected, my mom no longer sends me to my room. She plans social time with my friends. I am happier and doing better at school."